Shockoe began an engagement with VCUArts professor and researcher Susanna Klein to create an application that would allow her to study the role of technology inhabit reinforcement for student musicians. The project was a blast to work on, and it pushed our team to work better, smarter, and faster. Project manager, Rebecca Thompson, implemented new and effective PM techniques, while designers Mason Brown and Dan Cotting and developer Justin Boswell pushed through to create and build a product from scratch. Once the app was finished, Susanna was able to implement the tool in her study, and thus far results have been encouraging. This past week, Shockoe was very excited to speak on a panel at the annual edUi conference, which highlights tools, techniques, and theories for UX and UI at universities, libraries, and museums. The panel started with a summary of the project, its genesis, and what the relationship of a large public research institution was like with a private product firm. Susanna talked about how she leveraged Shockoe’s expertise in technology and design to help solve a problem she had seen with students and performers over her decades of music experience. Throughout her career, she had noticed that practice time was often wasted on inefficient of unfocused time spent with the instrument as well as habits that often led to injury or poor mental health around progression. Susanna came to Shockoe with a multitude of ideas involving an array of technologies including Microsoft Kinect, AR, and other sensor-based solutions, it was her engagement with Shockoe’s design team that helped her narrow into a product she could deliver to students quickly and one that could be used to study these habits in order to create an effective study. Dan touched on that original ask of the project, and how working alongside her with his team, Shockoe was able to introduce several product design concepts to help solidify an approach. One featured heavily in the panel was the effectiveness of user interviews and how that created a strong journey for all participants to center around when designing and developing the “V-Coach” application. The learnings from the user interviews largely drove design decisions that would ultimately be reported favorably by research participants. Mason then walked through several features of the app, showcasing how Shockoe used the UX strategy research, and turned it into an effective end-to-end product design that would satisfy users while effectively delivering for the study. Susanna then shared the current status of the results of the study, which are still being processed by statisticians, but the qualitative surveys issued have illustrated success so far. The team of VCU and Shockoe were able to produce an application that was able to solve practice woes brought to the table by Susanna while being easy to use and effective throughout students’ practice sessions. During the QA, audience members were able to engage with the panel, asking questions relating to Shockoe’s processes, timelines, research methods, and outcomes. It was a great opportunity to share some great outcomes with some great professionals in the field of design. Susanna Klein is the assistant professor of violin and coordinator of strings at her alma mater, Virginia Commonwealth University. She has 15 years of professional orchestral performing experience and currently enjoys focusing on chamber music performance with her trailblazer group ACE. Klein served as principal second violin of the Richmond Symphony for five years. Previous orchestral appointments have been with the Colorado, Memphis, Vermont, and Rhode Island Symphony Orchestras. She has been a member of two string quartets: Artist-in-Residence with the Oberon String Quartet at St. Catherines School in Richmond, Va. and violist with the Seneca String Quartet in Boston, MA. 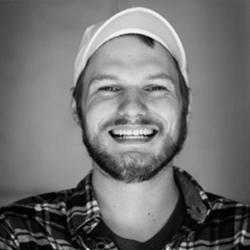 Mason Brown is an experience designer at Shockoe. Whether it’s designing applications for musicians, credit union members, or enterprise employees, Mason is passionate about creating quality tools that provide significant improvement to whatever task is at hand. 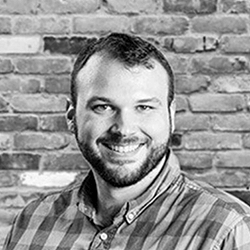 With years of experience in systems and product design, Mason works with clients to identify business problems, understand the needs of the user and craft products that benefit both. You can find him on the James River from 5 a.m. to 8 a.m. nearly every morning coaching collegiate, high school and para rowers while continuing his quest to see every single James River otter. With over a decade of customer and user experience strategy under his belt, Dan Cotting is Shockoe’s Director of Immersive Technology and resident “future-tech-crazy-person.” Dan fully believes that virtual and augmented reality will pave the way for an entirely new approach to business operations: improving the lives of both employees and consumers, while simultaneously increasing business efficiency and productivity. When he isn’t dreaming about this “Ready Player One” future, Dan spends his free time playing bass guitar, practicing 18th-century photographic techniques, brewing beer, and enjoying time with his wife Kelly and their five rescue pets. He holds a B.S. from Boston University and an M.S. from Virginia Commonwealth University.